In this exclusive audio montage Emmy Winner Charlotte Robinson host of OUTTAKE VOICES™ talks with celebrities on the Red Carpet at The Dinah Hollywood Party in Palm Springs. First we talked to TV comedy trailblazer Amanda Bearse who for the last 25 years has directed and produced “MADtv”, “Dharma & Gregg”, “Jamie Foxx Show” and is also known for her role as Marcy D’Arcy in the Fox classic comedy “Married With Children” about her new tello Films digital series “Skirtchasers”. She was with Christin Baker Executive Producer and CEO of tello Films and writer Stan Zimmerman (“The Golden Girls”, “Gilmore Girls”, “The Brady Bunch” movies) who brings over 30 years of writing and producing experience to the project. Bearse will direct four of the “Skirtchasers” series with Zimmerman directing one. “Skirtchasers” stars Elizabeth Keener (“The L Word”, “My Generation”) as Robyn Samuels and Barry Bostwick (“Rocky Horror Picture Show”, “Spin City”) as her estranged father Damien Samuels and Meredith Baxter (“Family Ties”, “Young and the Restless”) as her divorced mom Lilah. Robyn is freshly single after a break-up with her long time girlfriend the day before their wedding. As Robyn deals with mending her broken heart, she realizes her issues delve further than her issues with commitment; they go way back, to her father. After the split of her parents, her best-selling novelist father remarried a much younger woman and became a father again, abandoning Robyn. We talked to the trio about their inspiration for “Skirtchasers” that premiers on tello Films May 22nd and their spin on our LGBT issues. Next we chatted with the gorgeous Tucky Williams the creator, writer and star of the hit series “Girl/Girl Scene” and new tello Films series “Dagger Kiss”, a medieval fantasy sci-fi epic with lots of girls and corsets and kissing with new episodes every Sunday on tellofilms.com. 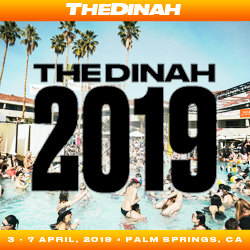 Then we talked to “Orange is the New Black” star Taryn Manning (Tiffany “Pennsatucky” Doggett) who was a celebrity DJ spinning at The Dinah Sunday Pool Party. When asked what she would like to see happen for LGBT equality Manning stated, “I think it’s happening. It’s one of those things where life isn’t a sprint; it’s a marathon. So it’s like if we try to expect results right away then you’re forcing something, perhaps. I think it’s actually evolving, unraveling and becoming more accepted as people can digest it the way God intended.” We then concluded with comedian, singer and actor Lea DeLaria who also stars in “Orange is the New Black” as “Big Boo” who headlined The Dinah Comedy Show Saturday night which was brilliant. We talked to Lea about her spin on the red states using religious freedom as an excuse to discriminate against our LGBT community and her spin on our issues. In this crucial presidential election year Lea was very compassionate and articulate about why she is supporting Hillary Clinton for President. What a great time at The Dinah....I love working the red carpet with you. You always get some gem out of each celeb. And, I love taking their pix.